Yoga has taken the world by storm in the last couple of decades, and especially in the last few years. There are so many varieties of yoga nowadays that it is literally impossible to even know what they all are. Yoga is a unity of body and mind, physical and spiritual. Ultimately that’s what we should seek from any yoga practice: strengthening both, body and mind. Whether it’s Goat or Harry Potter Yoga (yes, these two truly exist!) or Hatha yoga, if the spiritual component is not there then it becomes a fitness class rather than a yoga practice. It doesn’t mean it has to involve chanting or a long meditative practice; it can be something like, for example, working with breath during practicing postures or having a couple of minutes of quiet time at the beginning and at the end of the session, or just being present and mindful during the practice. Yoga strengthens body and mind; it makes us more supple and flexible both literally and figuratively. People are stronger and more flexible nowadays than they used to be decades before. It is actually breathtaking to watch strong, flexible yogis effortlessly flying into advances inversions , twists and balances! Backbends and Arm Balances are very trendy these days with all the social platforms full of pictures and videos of graceful handstands and bendy people. I am a big fan of both and do practice them often. But great care should be taken when trying to do it at home, especially when it comes to strong backbends. Backbends are wonderful for the health of your spine! With so many of us having office jobs and spending loads of time on electronic devices in a very much slouchy position, backbends are life saviours when it comes to maintaining good posture and keeping your spine mobile. As with any other movement, you always need to listen to your spine and work with how it feels and how far you can go into a backbend without compromising the posture. I very rarely go for an Upward Facing Dod posture not because I can’t get into it, but because my back feels better being in a cobra. Even if your back is comfortable with deeper backbends, you always need a proper warm up before you start moving from the Cat Cow or Baby Cobra into a High Cobra, Upwards Facing Dog or the Wheel Posture. All the backbends require not just spine, but shoulder and, in most cases, hip flexor mobility as well. That is why it is also important to warm up and mobilise your shoulders, chest, arms and hip flexors before attempting more prominent back extensions. Your backbend should be natural, even and not forced by jerking your spine into an uncomfortable position with collapsed chest and shoulders touching your ears. The backbend starts at the bottom of the spine and gradually flows along the spine and right into the top of your vertebral column. Your neck is the continuation of the spine and should not be tilted back. 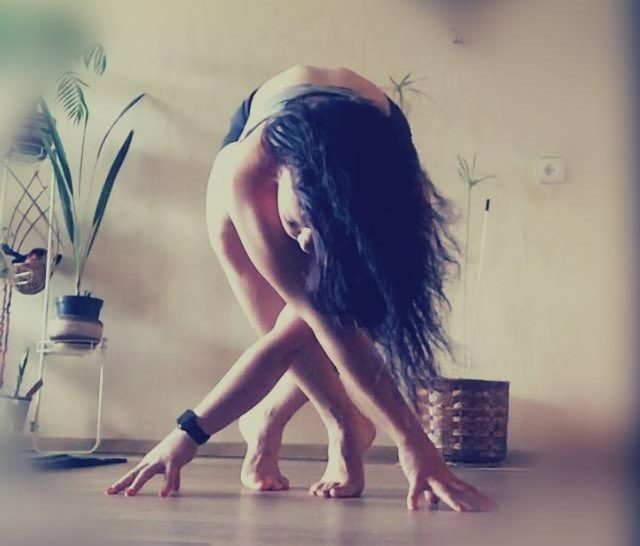 Every backbend would normally be followed by a counter pose – poses that require the flexion of the spine, such as a Cat Cow pose when your backbend in a Cat part is followed by rounding your spine in a Cow Pose. It is not recommended though to perform a counter pose after strong backbends as these put a lot of stress on your spine. Instead of, for example, going into a Child’s pose after a Camel one try maybe find a more neutral counterpose, like a gentle back flexion from the kneeling position. Backbends are awesome for improving back strength and flexibility – do them with the right form and you will rip those benefits in no time and will be able to progress into deeper backbends when the time is right! Hope you find this useful and if you have any questions please get in touch with me!